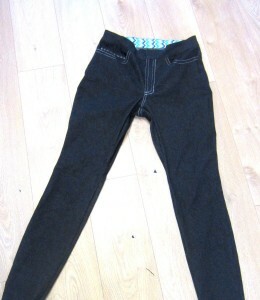 Sewing Jeans - Ginger Jeans! Having made the previous pairs I knew that otherwise the fit was pretty spot on. 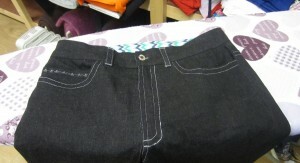 I cut a 14 from the hips to the thighs and tapered to a 12 at the waist and the lower legs. I think in retrospect a 12 overall will be ok in the next pair (especially after the January purging ;)).. I didn’t make any adjustments to these jeans and made them up as they were. I finished the front and backs and then I basted the side seams and inside legs together. They fit really good straight off – I decided to take them in a bit more at the hips and inside legs. 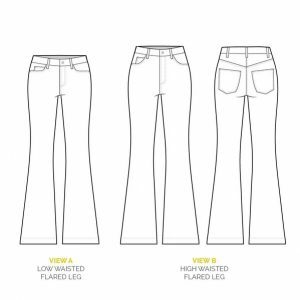 It’s probably necessary to leave a little room for maneuvering if you attempt jeans – every fabric and denim will stretch a little differently. It’s easy to baste the side seams and take in / let out as needed before you attach the waistband. I wore these jeans for about two days and then decided to take them in a bit in the legs – especially at the knee as they were a bit baggy and out of proportion. I haven’t hemmed them yet – I’ll wash them once or twice before I commit to the length. In my next pair I will take a pinch out of the front crotch length – see in above photo – there’s too much fabric near the bottom of the zip. That’s a standard fitting issue for me. 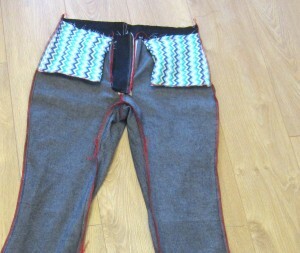 I started with the back pockets – I decided to use silver metallic thread to topstitch just for fun. My topstitching still isn’t the best and I’ve used the special topstitching thread with all my machines and it still doesn’t run smoothly – I will keep trying. I tried a few different decorative stitches on my machine and this is the combination I chose. 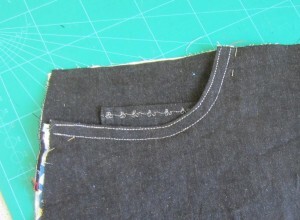 The front pockets: I also used the decorative stitch on the coin pocket. I finished all the raw edges with red thread on the overlocker. I like the contrast. 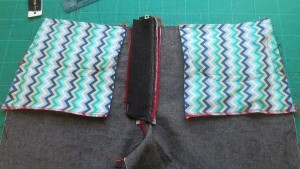 Inside view – I used this stenzo chevron cotton for the pocket bags and the inside of the waistband. 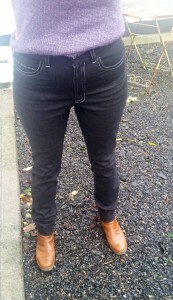 The Ginger Jeans and the Jalie bootcut jeans are the most comfortable jeans of any I’ve sewed for myself or purchased in a shop in the last decade (one of the main reasons I got back into sewing was because of the difficulty in finding clothes that fit my non standard body) so there are more in store. 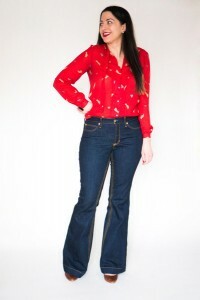 First up will be the new version – Flared Jeans Expansion pack that Heather of Closet Case Patterns has just released. 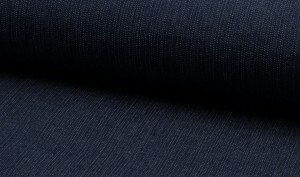 I’m going to make them in this new 12 oz denim that has only arrived today at Dress Fabrics. Its 95% Cotton and 5% Lycra. It should be sturdy enough to hold the shape of the flare. After that I’m going to go back to the Jalie Bootcut Jeans and I’ll make one or two pairs from some of the other denim in the shop. Followed by maybe a few pairs of skinny Gingers in cotton sateens when the weather warms up a bit. Big Plans!! Oh and I want to make a new Minoru coat before the winter’s over!!!! In Summary: I washed the denim for these jeans back in September and they were left on the to do pile once I got busy at the end of the year. I was fairly tired after all the sewing I did coming up to Xmas and the thoughts of taking on a ‘Big’ project was daunting. I cut these out just after new year’s day and after making a few quick sweatshirts etc I felt ready. 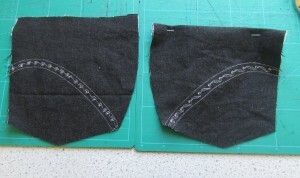 I started sewing the jeans the day before the boys returned to school and had them finished by Saturday Morning – I followed the online tutorial and completed each step – then took a break or left it til the next day. It got me back into the swing of things. So the lesson here is if you feel overwhelmed by a project – just break it up into short steps, take each step as a task and you will have a lovely finished project before you know it. Heather has a Sewing guide available to purchase & download if you needed a bit for information and details all in one file. 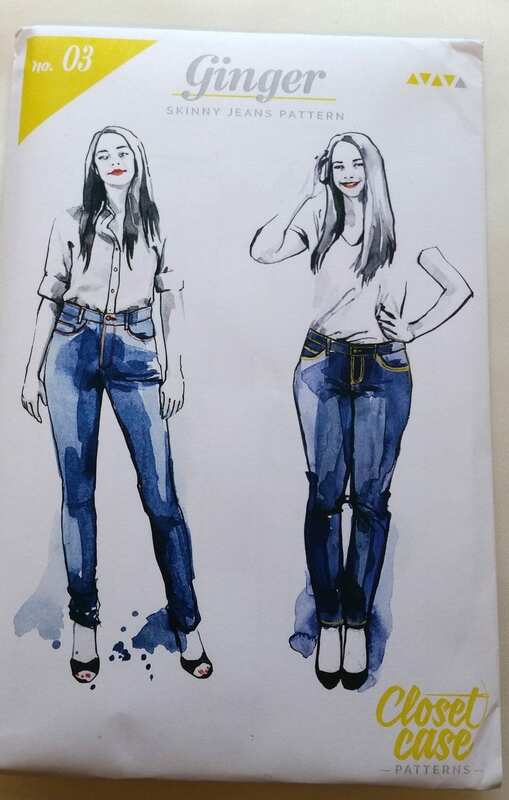 So – have you ever thought about making your own jeans??? Have I maybe planted a little seed of a thought in your head?? ?